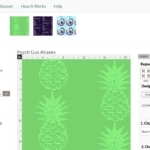 It’s terribly difficult not to be addicted to Spoonflower if you love fabric designs. Even if you don’t sew, there’s something about eye-catching fabric and the kind that feels just right on your skin. I wanted to begin designing fabric, but I’m not an artist! I would occasionally recommend to my artist friends that a pinup or sketch they made would look great as a pillow cover or dress fabric, but I don’t think anyone ever listened to my advice. In 2013, I took the bull by the horns and asked my friend Bill Ellis of Wildpig Comics if I could use his Delirium of the Endless sketch which was donated to one of Comic Fusion’s charity auctions. 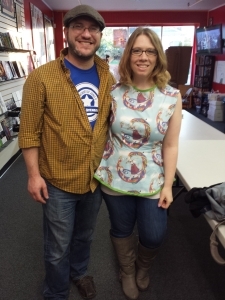 Bill sent me the digital file and I took care of setting up the Spoonflower shop. After the success of that making a dress and a blouse from the cotton version of the Delirium fabric, I moved on to make another Gaiman inspired fabric in 2014. I took various quotes from the Sandman series and tried to make a design that would be like those cool word clouds professional graphic designers can do with different fonts, weights, and orientations. 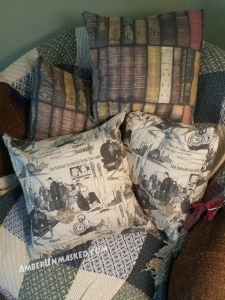 In 2015, I fell in love with all the crime noir fabric I found on Spoonflower. It’s kind of expensive even for basic cotton. I got enough to make covers for four throw pillows. I also found a lot of tardis and Doctor Who fabric on Spoonflower. I bought a small amount and made friends a ring bearer pillow for their wedding. I guess I never took photos of it. But trust me, if you’re in the market for Whovian fabric, go to Spoonflower first. This brings me to 2017. I used to have this great pair of pajama pants that were blue with pineapples on them (seen in this old animated gif of my beloved Caico). Of course they were too freaking long for my legs but the fabric was so comfortable and when it comes to my skin, that is key. They were probably from Old Navy. I wore them out until they were ripped and had coffee stains. They were important because they looked like they could have been PSYCH pajamas. As one of my all-time favorite TV shows, anything Psych seems marketed directly to me. They used to offer a lot of merchandise when the show was current, but now it’s finished (sort of!). There is a Psych Holiday Movie coming out soon! I haven’t sewn anything in an embarrassingly long time. 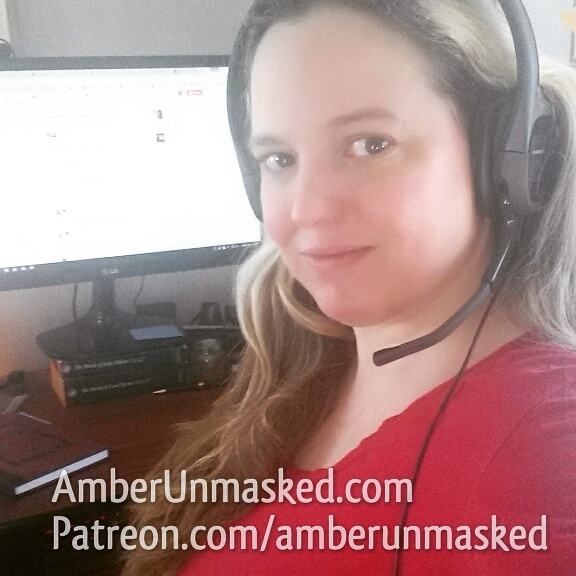 I’ve been way too focused on writing and managing my depression. However, since adopting the new boy and naming him after Psych’s Burton Guster, I am just as Psych-driven as before. 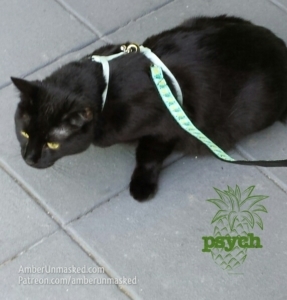 Gus’ leash is pale blue with yellow pineapples just like my old pajamas! 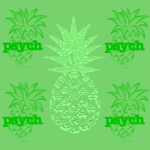 I was trying to make my first Psych fabric design similar in coloring with the blue, green, and yellow combination. Those colors were prevalent on the show usually in Shawn’s wardrobe or the interior design of rooms. Even when Gus is hostage in a bank heist, the bank was painted in a bright obnoxious green. I don’t know how to manipulate words well enough in GIMP to create exactly what I wanted. I used a word cloud generator instead. I experimented with the coloring. 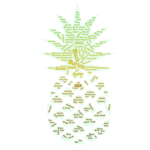 At first the pineapple mask was gradient from green to yellow to brown. I ended up using a burn layer instead; then changed it to value and it’s all green. 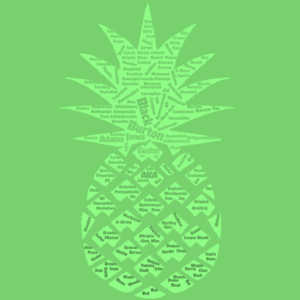 I had originally included the Psych logo, but that’s against TOS for Spoonflower and I didn’t want to get nailed for that. In the end, I went with an all-green version instead of the gradient or blue. I think I’ll make more with those other options. Then comes the unfun part of seeing if I can find any patterns in my size (groan) which is just as bad as shopping for clothes. I will add that Spoonflower has a page about the safety of the fabrics. They are not flame retardant and shouldn’t be used for children’s pajamas or bedding. I guess it’s fine if you want to make regular kids’ clothes, but that’s your decision as a parent or retailer. Just be sure they know.